Provide understanding of cultural phrases. 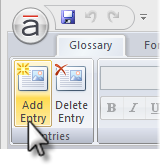 Steps: Located on the left side of the screen, this panel is used to manage entries for the Glossary. 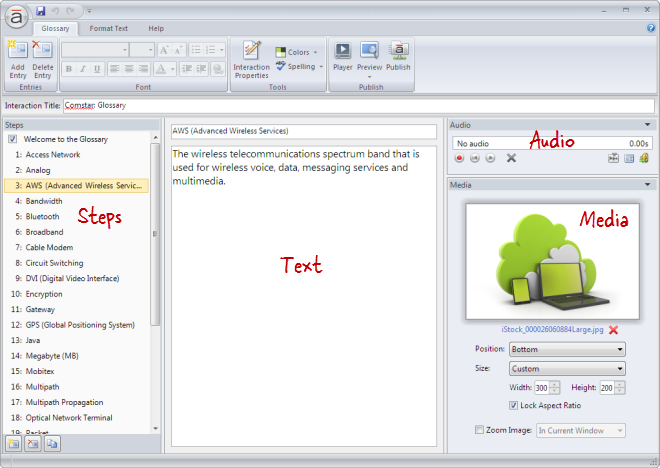 Text: Located in the middle of the screen, this panel is used to add text to each entry. Audio: Located in the upper right corner of the editor, this panel is used to add and edit audio. Media: Located in the lower right corner, this panel is used to add pictures, characters, videos, and Flash files. Change the width of a column by dragging its boundary with your mouse. Click the triangle in the upper right corner of the Audio panel to collapse it if you need more room to work with the Media panel. Click it again to reopen the panel. Go to the Glossary tab on the ribbon, and click Add Entry. Click the Create a new step button in the lower left corner of the Steps panel. Click the Duplicate button at the bottom of the Steps panel to copy the currently selected entry(s). New entries get added just below the entry that's currently selected in the Steps panel—unless the summary is selected, in which case new entries get added above it. Tip: A Glossary interaction can have an unlimited number of entries. Double-click the entry in the Steps panel to open it for editing. Enter the new name, and press the Enter key. Select the entry in the Steps panel, and type the new name in the title field at the top of the text panel. Tip: You can rename the introduction or summary in the same way. 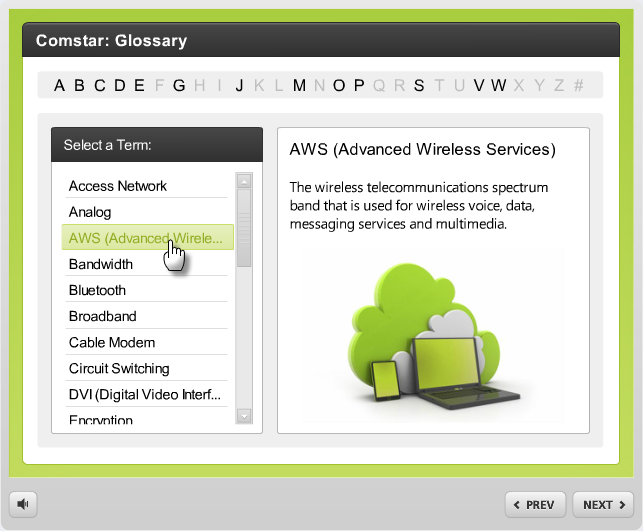 Articulate Engage automatically arranges glossary entries alphabetically. To change the order, rename one or more entries using the options above. 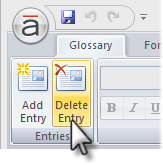 Go to the Glossary tab on the ribbon, and click Delete Entry. Click the Delete button at the bottom of the Steps panel. Tip: You can't delete the introduction or summary, but you can hide them. 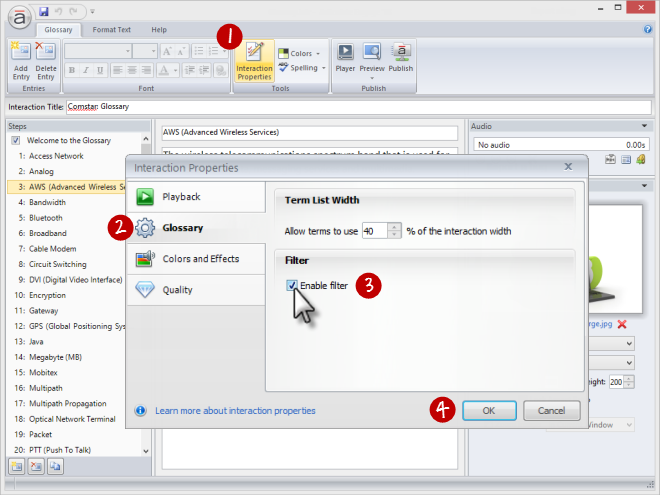 Go to the Glossary tab on the ribbon, and click Interaction Properties. Select the Glossary tab on the left side of the window. Enter a percentage between 20 and 60 in the Term List Width field. 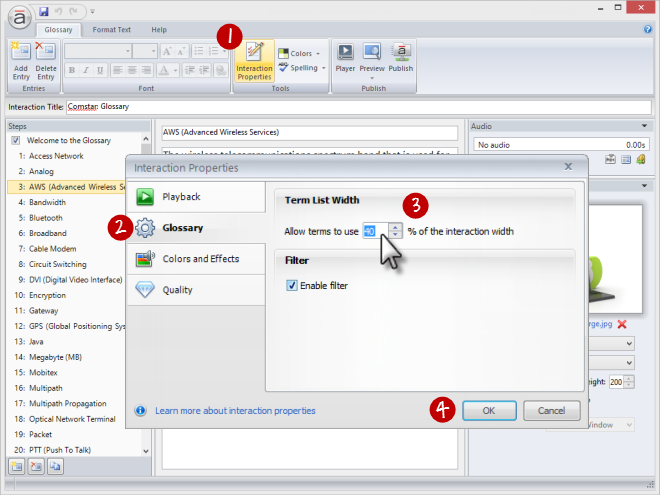 Engage gives you the option of adding a filter to your glossary. The filter makes navigating lengthy glossaries easier. When enabled, it appears across the top of your published interaction. Simply click an active letter to jump to that portion of the glossary. Mark the box to Enable filter.